The BIGGEST ukulele orchestra in the world! The Fabulous “Kiwileles” is the biggest ukulele orchestra in the world, based in New Zealand. At this year’s New Zealand Ukulele Festival there are expected to be over 2500 Kiwileles (kids playing ukuleles) from 117 schools to perform alongside national and international ukulele artists. The Festival is in its 5th year, bringing together diverse musical styles, international artists, great local talent, emerging bands, school children and community groups with food, music stalls and instrument sales. 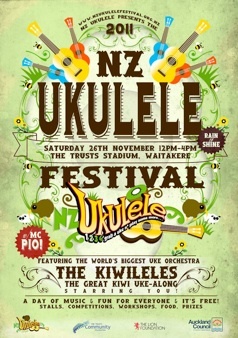 The festival in its fifth year is organised by the New Zealand Ukulele Trust. Take your ukulele along to the festival, it’s a family fun day for free!